Is there really only sand and rock on Mars? It depends what you mean by “only” sand and rock. Is there life on Mars right now? Probably not - it’s pretty cold and cancer-inducing on Mars at the moment. The Mars rovers have been telling us that there was probably a lot of warm, life-friendly water on Mars, back before the planet lost most of its atmosphere. There was nothing - as far as we can tell - that would have prevented life from existing. 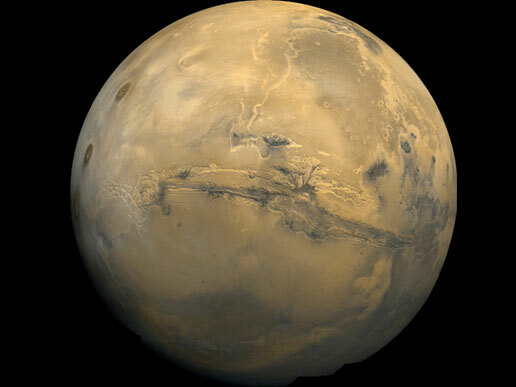 So that’s pretty exciting - we may someday find evidence that life existed on Mars in the past. But let’s assume that we don’t find life - or evidence that it once existed - on Mars just yet; what’s left on the rusty Red Planet? We tend to have a rather biased view of what Mars looks like from the surface, because we only have so many pictures from the rovers. The rovers have sent back lovely pictures but they tend to be on rather flat ground, which makes Mars look less interesting than it could. There’s a very important reason for this; we can’t land rovers on very rocky ground or at high elevation. We need landing sites to be at low elevation so that there’s a lot of atmosphere to help slow it down, and we want the ground to be flat so we don’t accidentally drop a very expensive machine on a boulder. There is more than just sand and rock on Mars- it has pretty substantial polar ice caps that are mostly water ice - it’s just a bit too cold on the surface for the ice to melt into anything liquid. These grow and shrink with the seasons, just like our ice caps. But even just the sand and rock on Mars is pretty impressive. Mars has some of the most dramatic geography in the solar system. Olympus Mons is the biggest volcano in the solar system - it’s 14 miles high. That makes it 3 times higher than Mount Everest, and twice as big as Mauna Loa, if you start counting from the ocean floor. Hawaii is actually a pretty good comparison - the two are the same style of volcano, but where Hawaii has moved in relation to the hot spot beneath it, which keeps the volcanoes from getting too huge, Olympus Mons just stayed put. Mars has never had any plate tectonics, so there was nothing to move the volcano, and it could just grow and grow and grow. 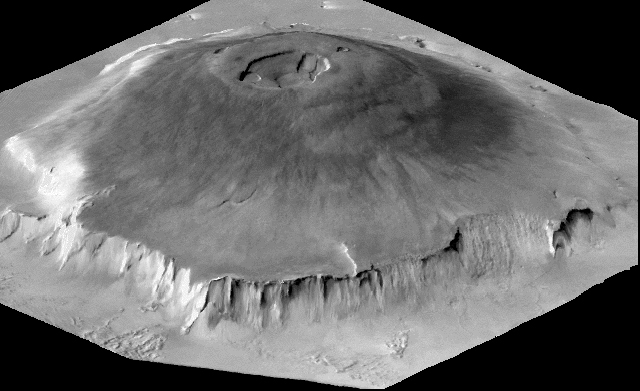 Olympus Mons is actually just the biggest and most impressive of a series of extinct volcanoes on Mars. It has cliffs several kilometers high right at the base, which will make for an incredible climb whenever we get people over to Mars, but is a rather severe impediment to getting rovers over to the volcano. Valles Marineris is another place we can’t go with rovers; it’s pretty much the Grand Canyon on steroids, and hiking the Grand Canyon is tricky enough. Trying to land something the size of an SUV on the rocky ground will take quite some doing. It’s almost 8 km deep in places, and 3,000 kilometers long. By comparison, the Grand Canyon only gets 1.8 km deep, and is only 800 km long. Water very likely flowed through it, back when there was water aplenty on Mars, but it’s still a little up in the air whether or not it was formed by water. And if that’s not enough, sometimes the dust on Mars decides that it’s tired of being dust on the ground, and can get caught up in such dramatic dust storms that they can cover the entire planet in a shroud of dust. Mars is well worth exploring, even if there aren’t fields of green or rivers to lure us there. Have your own question, or something unclear? Feel free to ask!